Good morning from Germany, welcome to our Daily FX Report. High yielding currencies are losing against the USD while we are still looking forward to see the U.S. data, which are expected to be positive. Anyways, we hope you will have good luck in trading. The AUD fell to its lowest level in 11 weeks against the USD after investors expected an improving U.S. economy could prompt the Federal Reserve to withdraw stimulus, which reduced Australians yield advantage. The NZD touched its lowest level in almost a month against the U.S. currency as futures trading in Chicago indicated a 46 percent chance that the Federal Reserve policy makers will increase the target interest rate for overnight lending by at least a quarter-percentage point in June. The AUD/USD fell for a second day after reaching a low at 0.8765, which was the cheapest price since October 6th. The NZD also fell for a second day as it reached a low at 0.7031 after opening the week at 0.7111. During the past trading days, the USD gained against a basket of currencies after economists expected that the economic data from the U.S. will be positive. The U.S. personal spending forecast is an increase of 0.7 percent in November, which would be a gain for a second month in a row. The USD/JPY climbed for a sixth day after it touched a high at 91.48, which is the strongest level since the end of October. The EUR/USD pulled back a bit after it fell yesterday for a fifth day. It touched a low at 1.4262 on Friday, which was the lowest level since the beginning of September. 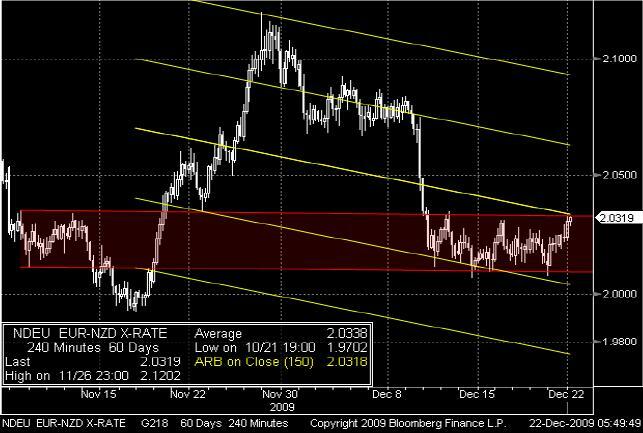 As you can see, the EURNZD is still trading inside the horizontal trend channel, which was established at the beginning of November. At the moment, the pair trades close to the upper line of the channel and the middle level of the Auto Regression Bands. If the EUR is strong enough to break both lines, it may rise towards the next Auto Regression Band. 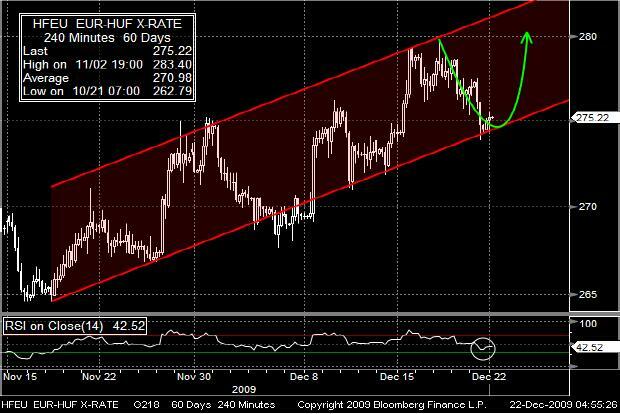 Since the middle of November, the EUR/HUF has been trading in a bullish trend channel. As you can see, the market has reached the lower line of the channel after it moved in a zigzag formation. Additionally, the RSI has reached the green support, which may be a confirmation for a pull-back towards the upper line of the channel.